The Teatro Capranica is a theatre situated at 101 Piazza Capranica in the Colonna district of Rome. 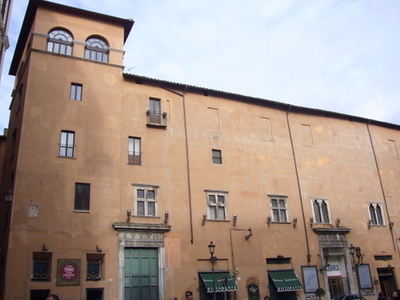 Originally constructed in 1679 by the Capranica family and housed in the early Renaissance Palazzo Capranica, it was the second public theatre to open in Rome. It was the site of many premieres of Baroque operas including Caldara's Tito e Berenice, Scarlatti's Griselda, and Vivaldi's Ercole su'l Termodonte. The Capranica ceased operating as a full-scale theatre and opera house in 1881 and in 1922 was converted into a cinema. Following the closure of the cinema in 2000, it has functioned on a hire basis as a conference and performance venue. After the closure of the Cinema Capranica in 2000, the 800 seat theatre with its now minimal stage was re-opened as a conference and performance venue available on a hire basis. Under the propietorship of the Hotel Nazionale and managed by Montecitorio Eventi S.r.l., it has hosted four small-scale opera productions by the association "Aulico – Opera & Musica" and over the years has been the setting for numerous meetings of Italian political parties. In January 2013, Silvio Berlusconi gave a two-hour speech there in which he introduced the Popolo della Libertà candidates for the 2013 Italian general election. During a meeting of the Partito Democratico at the Capranica that lasted late into the night of 19 April 2013, Pier Luigi Bersani resigned as party leader following his failure to form a coalition government and the defeat of Romano Prodi in the presidential election. Here's the our members favorite photos of "Theaters in Rome". Upload your photo of Teatro Capranica!